This will probably be my last blog post of 2011. It's been an extraordinary year! 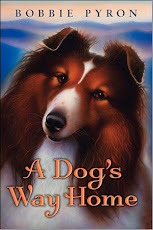 A Dog's Way Home came out in March and has amassed a lot of fans. Abby and Tam's story has brought me many new friends from all over who've written to me to tell me how much they loved the book. That, more than foreign sales and film rights, is what makes all those lonely and sometimes difficult hours at the computer worth while. I can think of no better way to end the year of blogging than by sharing my most recent friend I've made and her beloved sheltie. Molly read A Dog's Way Home and loved it so much, she did her school book report on it and created this gorgeous painting inspired by the book. 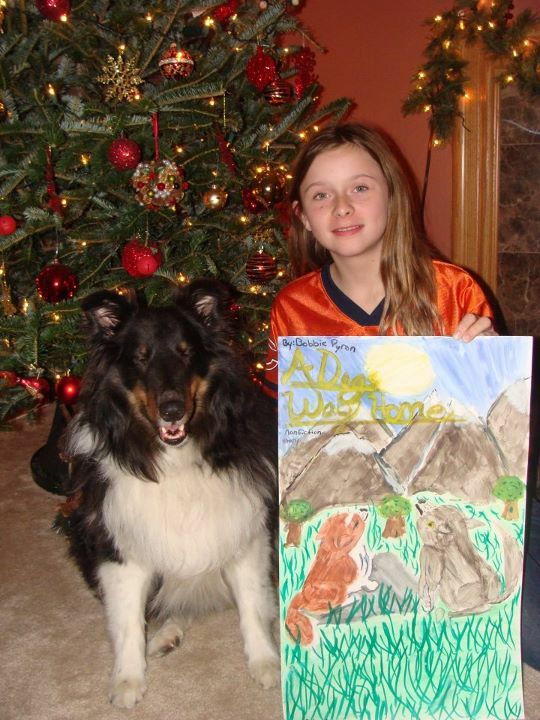 Her proud papa, Tom, contacted me and sent me a picture of Molly, her art work, and her sheltie buddy, Harley. Needless to say, his note and photo moved me to tears and made me very proud too! Tom wrote: "Here is a picture of my Daugter Molly and Harley. Molly did a 5th grade book report on A dogs way home. As part of the report each student had to do a picutre from the story. 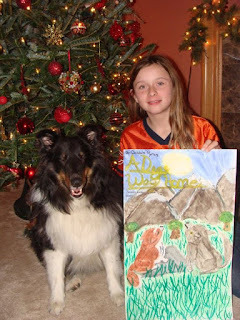 Molly painted in watercolors a picture of Tam the Sheltie and a Coyote watching the moon over the mountains. Molly got an A on her report she is a very talented artist and has been entered in many comptitons and won a few awards. I am very proud of her (and Harley too)!" "Life With a Sheltie Means..." Winners! "My turn! No, my turn!" 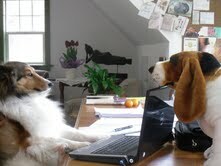 I had ten wonderful essays and even poems celebrating life with shelties! They were all heartwarming, funny, and passionate about this wonderful breed we share our lives with. As I read through the essays and poems, I realized there was no way I could choose the three best--they were all "best"! So I figured the fair thing to do was draw three names out of a hat. And who better to do that than my dogs! But the three didn't quite get the concept of lining up and each choosing a name one at a time. I made an executive decision (being their Girl and all) and designated Teddy as the chooser of names. After all, Teddy, at just weeks from being 13, is Senior Dog. 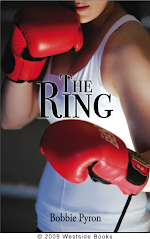 I'll be contacting you to get your mailing address so I can send you your book. I would also like to post everyone's essays and poems individually on my blog during the next few months. I will not post your full name or contact information. Please let me know if you prefer not to have your entry posted. Many thanks to everyone for entering! I'll be making a donation to Sheltie Rescue of Utah for $60.00 in all of your and your shelties' honor. 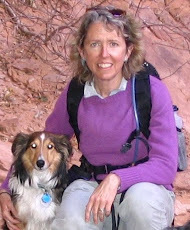 Fido and Friend in Five: Donna McAleer and Col. Thayer! In October, I was asked to be one of three featured authors at the annual fund raiser for the Utah chapter of the American Association of University Women. The three of us were to talk on the theme of finding our passion. The other two authors, both amazing women with recently published books, were Jennifer Jordan and Donna McAleer. As the three of us talked before the program started the subject inevitably came round to dogs. As it turned out, they both have much adored dogs. I knew there was I reason I connected with them both right away! Now when you first meet Donna, she is rather quiet and just sort of taking in everything around her. So imagine my surprise when I learned straight away that she is a West Point graduate and served as an Army officer! Okay, and not only is she a West Point grad, she finished 4th in the women's bobsled trials for the 2002 Winter Olympic Games team! Donna is also a ski instructor, and inspirational/motivational speaker. 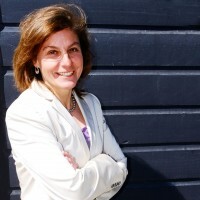 In the past, she's also worked as a non-profit executive director, high school coach, and lots of other things. Donna recently added author to that list of achievements. 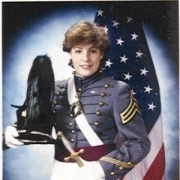 Inspired by her time at West Point and as a U.S. Army officer, she wrote Porcelain on Steel: Women of West Point's Long Gray Line. Her book is an insider's look at that male-dominated, storied institution that produces leaders for our military and nation. She also presents the long-overlooked history of women at West Point. Porcelain on Steel was the 2010 Gold Medal Winner for the Military Writers Society of America. 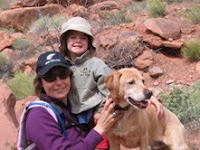 Donna, her husband, and daughter Carly, share their home and love of the outdoors in Park City with their faithful companion, Colonel Thayer. Donna took out time from her very busy schedule to talk with me a bit about her very sweet Colonel. 1. How did you and Colonel Thayer find each other? At a summer bar-b-que. In the spring of 2000, Ted, my husband and I began talking about getting a dog. 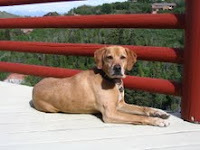 Park City, Utah is a dog lover's paradise with lots of trails and open space. Invited to a bbq by my yoga instructor, we met our soon-to-be faithful four-legged companion. At some distance from the grill, several bales of hay made a large circle where two playful puppies wrestled and looked longingly for some human affection and belly scratches. They caught Ted's attention. He asked Natalie, the host, to whom the cute dogs belonged. Natalie explained that the neighbor had an unexpected litter (a mix of Vizula's and yellow labs) and was looking for good homes for the puppies. And then asked if he wanted one! Ted found me and said, "You have got to see these five-week-old puppies looking for a home." Ted turned to me and said emphatically, "We have to take one!" Astonished, I replied, "You are crazy! 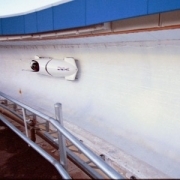 I'm leaving for a four-week training camp in Lake Placid (for bobsled) in less than a month." He responded, "You never do anything spontaneous. We have to take one. You drive and I'll hold the dog." Some people leave parties with full bellies, with new friends, with a little too much alcohol--we left with a puppy. Upon arriving at home, we realized we had nothing for a puppy. We made a bed out of a box and blanket. The puppy whimpered nearly all night. The next morning I called Natalie to double check that the dog's owner was truly looking for a family. Natalie assured me they were. Then she asked, "What did you name him?" Quickly I responded, "Thayer." After a long pause, she said, "As in Colonel Sylvanus Thayer?" "Exactly," I said. "How do you know about him?" "I'm a direct descendant of his," she said. "Thayer is my middle name" We were meant to be together! As an aside, Colonel Sylvanus Thayer (June 9, 1785-Sept. 7, 1872) is known as "the Father of West Point." Both Ted and I are graduates of West Point. We wanted our canine companion to have a name of military historic significance. Eisenhower had too many syllables. 2. What makes Thayer's tail wag? Trail running, hiking, snowshoeing, any flavor of ice cream and moose droppings. 3. What's your all-time favorite dog story? It's too difficult to pick just one! 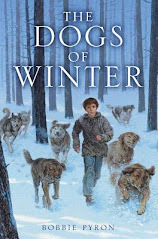 Call of the Wild, by Jack London, Stetson the Park City Dog, by Jeanne Heil, a wonderfully illustrated book about an abandoned dog who becomes a ski patrol dog in Park City. The Art of Racing in the Rain, by Garth Stein. 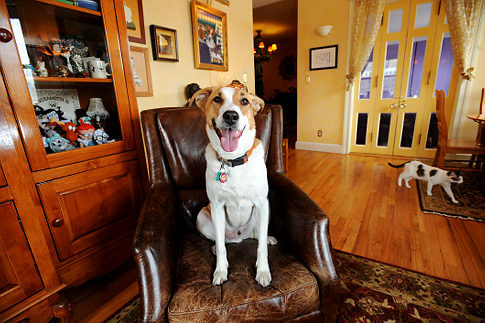 Enzo, the dog narrator of the book is soul mates with Thayer. 4. If the Colonel could change just one thing about you, what would it be? That I ran faster and didn't spend so much time in front of an illuminated screen, writing. Okay all you sheltie lovers out there, this is your last week to enter! I've had eight entries so far in the essay contest and I want more! As an extra enticement, I'm upping the number of winners who will receive a signed copy of my book to three. I'm also going to donate $5.00 to Sheltie Rescue of Utah for every entry I receive, rather than two dollars. Your entry can be as an essay, poem, or short story, but it needs to be 350 words or less. Please send a photo of your sheltie(s) along with your entry. I'll be posting these on my blog after the holidays. All entries must be received by Dec. 17th! Let's celebrate life with shelties and help other shelties in need! 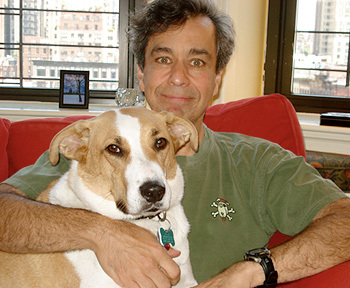 Fido and Friend in Five: Chris Grabenstein and Fred! I've had quite a few "firsts" on Fido and Friend in Five. Gareth and Jack were my first duo from another country. Jeff Crosby was the first author/illustrator I had in the spotlight. And Kate Morgan Jackson was the first editor. 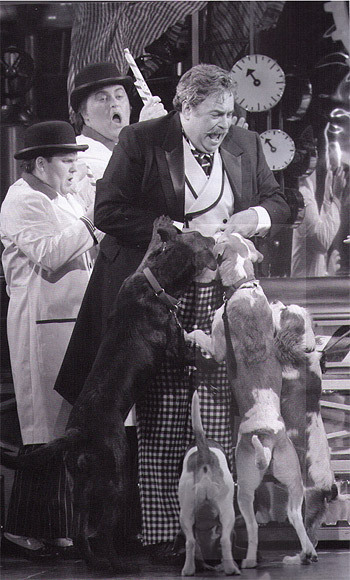 Today's spotlight brings yet another first for Fido and Friend in Five: a dog who was a Broadway star! And not only was Fred the dog a stage actor, but his person, Chris, was once an improvisational comedian! Neither of this duo graces the stage any longer, but that doesn't mean that don't appear in the spotlight (other than this one) from time to time. Chris spent nearly twenty years writing commercials for ad agencies. Some of his commercial spots include 7-Up, KFC, Dr. Pepper, Miller Lite, and others. It was while writing ads that Chris's writing talent was discovered by none other than James Patterson! At that time, Patterson was Chris's Creative Director at J. Walter Thompson Advertising. Chris's writing career expanded to writing screenplays. He co-wrote the screenplay for the CBS-TV movie THE CHRISTMAS GIFT, starring John Denver. He also wrote scripts for "The Muppets." 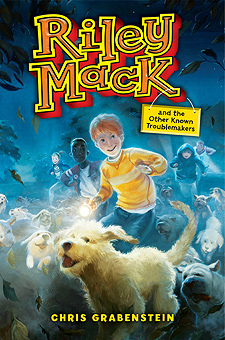 He has gone on to write award-winning mysteries for both adults and middle grade readers. 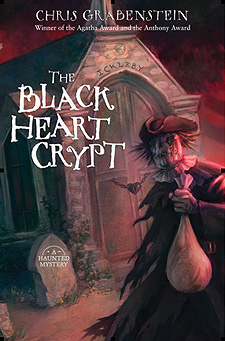 The Black Heart Crypt, his latest middle grade mystery, caught my eye and led me to Chris's website where I saw his picture with the most handsome Fred! Fred's story is every bit as amazing as Chris's. Fred was an abandoned puppy trying to survive on the streets in the Bronx when he was taken to a "kill shelter." 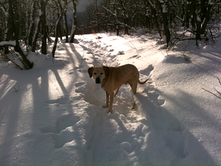 Fortunately for all of us, Fred was rescued by Hollywood dog trainer, Bill Berloni. Fred was trained to star in the Broadway production of "Chitty Chitty, Bang Bang." 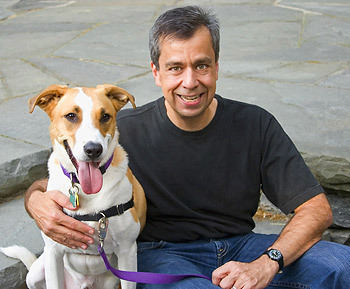 When the production closed, Fred moved up to Berloni's Connecticut home and lived with the trainer's other 15 dogs, all of whom have starred on stage and screen and were shelter rescues. We'll find out in our chat with Fred and Chris how Fred came to live in Manhattan with Chris, his wife and two cats. That doesn't mean, though, that Fred has avoided the spotlight. The New York Daily News ran an article about Fred in 2010, and he has his own book, Broadway Tails: Heartfelt Stories of Rescued Dogs Who Became Showbiz Superstars, by William Berloni and James Hanrahan. 1. How did you and Fred find each other? Thanks to a friend who works in animal rescue with my wife, we were put in touch with famed Broadway animal trainer, Bill Berloni, who volunteers at the New York Humane Society. Fred had just completed a run on stage in the Broadway musical, "Chitty Chitty Bang Bang" with six other dogs, and wanted his own forever home. We feel very lucky to have a star licking our faces. 2. What makes Fred's tail wag? People! Fred loves meeting folks. We call him the mayor of 81st Street. 4. If Fred could change just one thing about you, what would it be? He would change my face into a rump roast. 5. Tell us in five words what Fred means to you: Joyful friend who's always happy. AND THE OTHER KNOWN TROUBLEMAKERS due out soon!